After months of hearings, forums, discussions and negotiations, City Council Speaker Melissa Mark-Viverito announced that the council made changes to two plans by Mayor Bill de Blasio to change the city's zoning regulations to help spur the creation and preservation of 200,000 units of affordable housing by 2024. NEW YORK CITY — After months of hearings, forums, discussions and negotiations, the City Council made changes to Mayor Bill de Blasio's plan to rezone neighborhoods across the city to spur the creation and preservation of 200,000 units of affordable housing by 2024. With the mayor and the major coalition of advocacy groups that had opposed to the plan now on board, the City Council is expected to approve the plans next week. DNAinfo New York laid out the mayor's original plan here. This zoning change would require some new construction to include a certain amount of permanently affordable housing. Under Mayor de Blasio's proposal, developers had three options for the level of affordability in each project. Under the first two options, 25 percent of housing would have to be affordable to those making 60 percent of area median income or AMI, or 30 percent of housing for those making 80 percent AMI. READ MORE: What is AMI? That amounts to an income of $46,620 for a family of three with a two-bedroom apartment renting for $1,150 for the first option and $62,150 for a family of three with a two-bedroom costing $1,550 per month under the second option. A third option dealt with people who made 120 percent of AMI. Thirty percent of housing would be reserved for people in this income bracket which amounts to $93,240 per year for a family of three with the rent for a two-bedroom costing $2,350 per month. ► Allowed developers a choice of creating 20 percent of housing for people making 40 percent of AMI in neighborhood-wide rezonings. Forty percent of AMI is a yearly income of $31,000 for a family of three. ► Added a band of 10 percent of housing at 40 percent of AMI as part of the option to build 25 percent of housing at 60 percent of AMI. ► Altered the option of building 30 percent of housing for people who make 120 percent of AMI to 30 percent for those at an average of 115 percent of AMI with 5 percent required for people who make 90 percent of AMI and 5 percent for people who make 70 percent of AMI. ► The administration, according to the City Council, has agreed to use optional financing programs to bring affordability down to 30 percent of AMI in the neighborhoods that are being rezoned, which housing advocates had called for. Nothing is in writing, though. ► Changed housing construction permits to expire in four years unless significant construction has been done. ► Required the Department of Housing Preservation and Development to comment on or attend the hearing of any developer seeking to get a financial hardship waiver from the Board of Standards and Appeals to get out of the affordable housing requirements. Area Council members would also be notified of any waiver requests. ► Under de Blasio's plan, developers could build the required amount of affordable housing on another site. If they choose that option now they will have to build 5 percent more affordable housing. And market-rate developers seeking approval to build taller must put all required affordable housing units on site. ► Affordable units must be distributed on 65 percent of a building's floors and affordable residents cannot be denied access to building amenities such as a pool or gym. 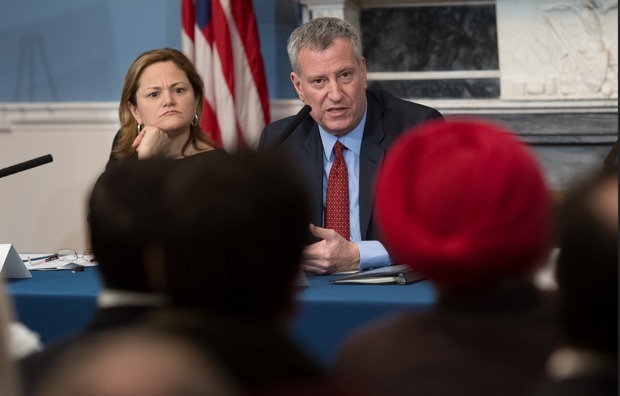 ► The de Blasio administration will support legislation to create a citywide no-harassment policy. Under this proposal, developers would increase building heights and parking would be optional to spur construction of affordable and senior housing. ► Under de Blasio's proposal, developers could reduce or remove parking for senior housing as of right. The City Council modified the plan to say that any new housing built on the site of former parking can't include market-rate units. ► The Council also modified the provision that would have removed parking requirements for affordable housing within a transit zone. The City Council changed the transit zone map to exclude areas that many agreed have inadequate transit options. ► De Blasio's plan would have allowed an additional 5 feet of space for buildings to have taller ground floors to accommodate commercial space. Developers would have also been able to add an additional one or two stories for affordable housing or senior housing. The City Council eliminated those requirements only in the Manhattan core. ► The minimum size of senior citizen apartments under de Blasio's proposal would have been 275 feet. The City Council increased the minimum to 325 feet. ► Buildings with affordable housing or senior housing would have been exempt from the "sliver" law, which prevents taller narrow buildings from being built next to shorter adjacent buildings. The City Council removed the exemption. The Council's land use committee is expected to vote on — and pass — both ZQA and MIH on Thursday. The full City Council will vote next week.